Topological qubits will be one of the key ingredients in the Microsoft plan to bring a powerful, scalable quantum computing solution to the world. Providing increased resistance to outside interference, topological qubits create a more stable foundation than conventional qubits. This increased stability allows the quantum computer to perform computations that can uncover solutions to some of the world’s toughest problems. While qubits can be developed in a variety of ways, the topological qubit will be the first of its kind, requiring innovative approaches from design through development. Materials containing the properties needed for this new technology cannot be found in nature—they must be created. Microsoft brought together experts from condensed matter physics, mathematics, and materials science to develop a unique approach producing specialized crystals with the properties needed to make the topological qubit a reality. For proper qubit function, the crystals must perfectly match specifications. Beginning with raw elements, the team developed a plan to create a structure that will perform as required. Purity. A pure environment is essential to creating the cleanest crystals possible. The cleaner the crystals are, the more likely they are to behave as expected. Some of the cleanest semiconductors have been made using molecular-beam epitaxy. Precision. The atomic-level precision helps create crystals with the exact properties required at extremely small scales. Molecular-beam epitaxy can even create 2-dimensional or 1-dimensional matter. Speed. Paramount to a rapid development environment, molecular-beam epitaxy offers high throughput and fast turnaround. For example, if the team has a new idea, the envisioned structures can be created and ready for testing six hours later. Inside a large, ultra-high-vacuum, stainless steel vessel, the process begins with elements that will make up the specialized crystal. The environment is purified by removing all existing atoms and molecules through extensive pumping and baking of the vessel walls. 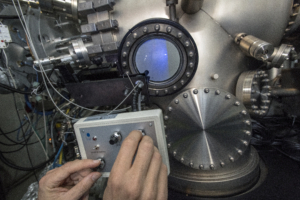 Once the vessel is prepared, a wafer-like substrate is inserted and heated to several hundred degrees Celsius and beams of atoms are shot directly at the substrate. Due to the purity of the environment, the atoms go directly into the substrate as though they are spray-painted one layer at a time. The wafer-like substrate serves as a blueprint for the atoms to arrive, creating a map on how they should arrange themselves. To create a quantum state, the topological qubit uses a combination of superconductivity and semi-conductivity, which is the first time these two properties have been bridged in such a controlled way. While molecular-beam epitaxy is most widely used to develop semiconducting materials, it’s a perfect method to provide the control needed for a successful combination of superconductivity and semi-conductivity. The qubit heterostructure features an atomically abrupt interface, which means layers of atoms are dropped onto the substrate to produce the crystal. The qubit heterostructure is grown using layers of aluminum for superconducting properties, and layers of indium arsenide or indium antimonide for semiconducting properties. This layer-by-layer approach allows the team to design the electronic properties to meet the precise specifications for the topological qubit to function. The topological qubit also features crystal nanowires, which are grown using selective area growth, a subcategory of molecular-beam epitaxy. This approach differs in that the substrate is preconditioned to accept the atoms in specific areas versus across the entire substrate. In this manner a very precise network of interconnected topological wires can be fabricated completely within the molecular-beam epitaxy system. By growing the materials to create the qubit heterostructures and nanowires, all aspects of the properties are controlled, leading to accurate qubit function and cleaner data. As the Microsoft Quantum team continues the development of the topological qubit, the precision of these unique growth methods will help make the vision of scalable quantum computing a reality. 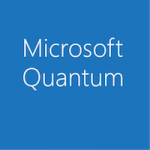 Follow along on the path to scalable quantum computing with the Microsoft Quantum newsletter.